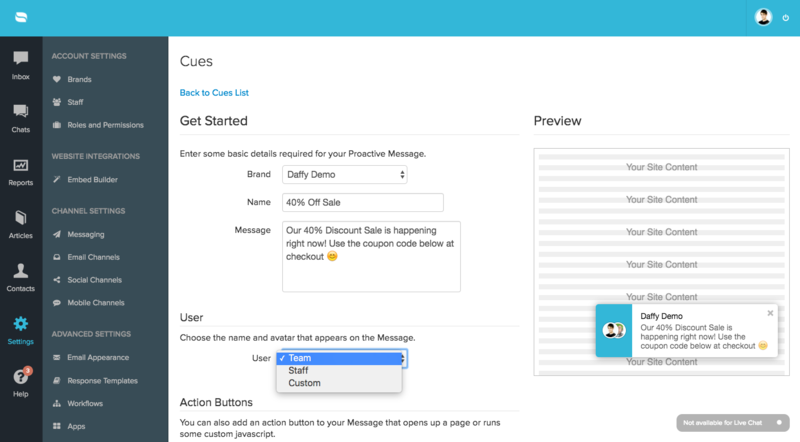 Reamaze Cues give you the ability to proactively send messages/prompts/notifications to online customers. This extremely powerful tool helps you engage customers efficiently by using rules and conditions to identify cohorts of customers. Cues can be created using the specific builder found in your settings menu and can be saved for future reference and editing. Cues can work in conjunction with your Reamaze Shoutbox/Lightbox or as a standalone Embed (with the base installation of Reamaze JS found here). When used in conjunction with a Shoutbox or Lightbox, Cues will inherit the same theme color and attributes belonging to your Shoutbox or Lightbox Embed. To edit or change these configurations, use the Embed Builder to do so. Before proceeding, we highly recommend installing the Reamaze Shoutbox/Lightbox. Go to "Settings" and then "Cues". Then click on the "+ New Cue"
Under the Get Started section, first pick the brand you want the Cue to display for. 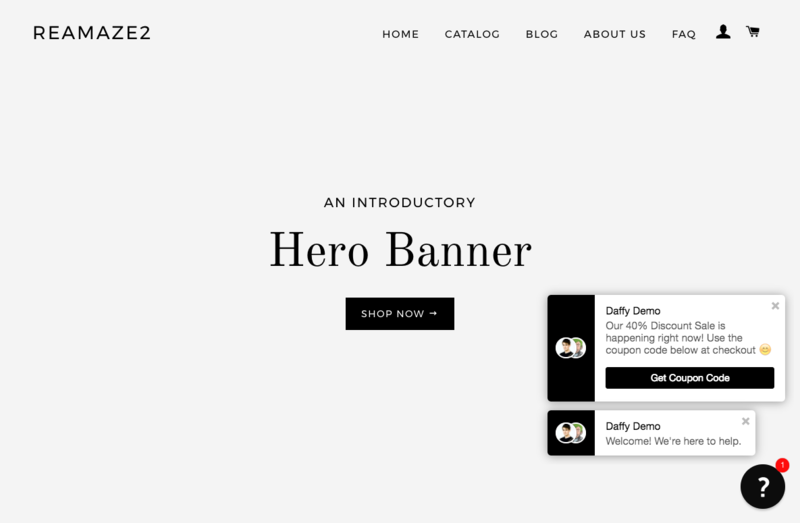 Make sure this matches the current Shoutbox/Lightbox implementation you have on your site. Next, give your Cue a name for easy referencing. This name is internal and not displayed to customers. Proceed to compose the message you want the Cue to display. 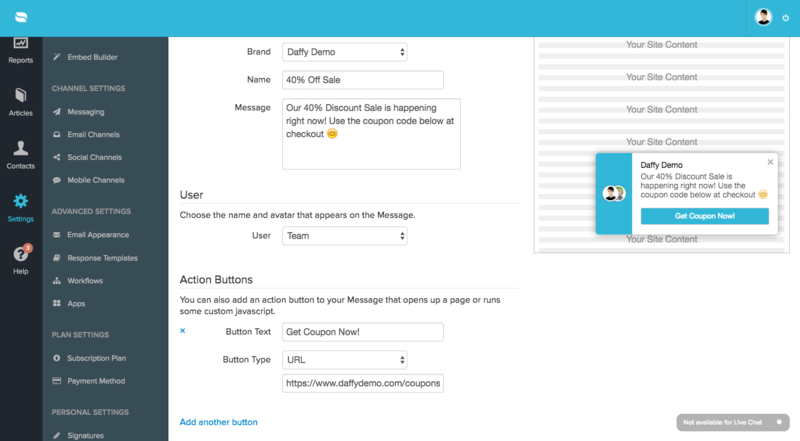 This can be anything from telling customers about a discount, a sale, or announcing a new feature. It's up to you! Under User, pick the avatar you want to use for the Cue message. You can pick from several options including a team avatar, individual avatar, or a custom avatar. Next, you'll want to set up some rules and conditions for the Cue. Any give user must satisfy these rules and conditions in order for the Cue to trigger and display. There are many to choose from so pick wisely! If you're unsure, create an easy Cue rule and you can always come back to edit it or create more later on. You can create multiple rules for your Cue. Implementing your Cue(s) is as easy as implementing your Reamaze Shoutbox/Lightbox. 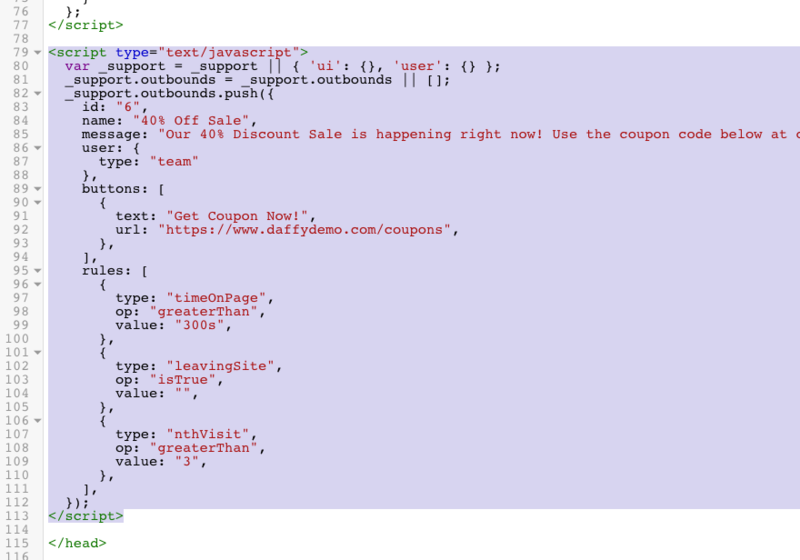 If you're not using one of our supported eCommerce platforms like Shopify or BigCommerce, the preferred method is to use our Google Tag Manager integration. 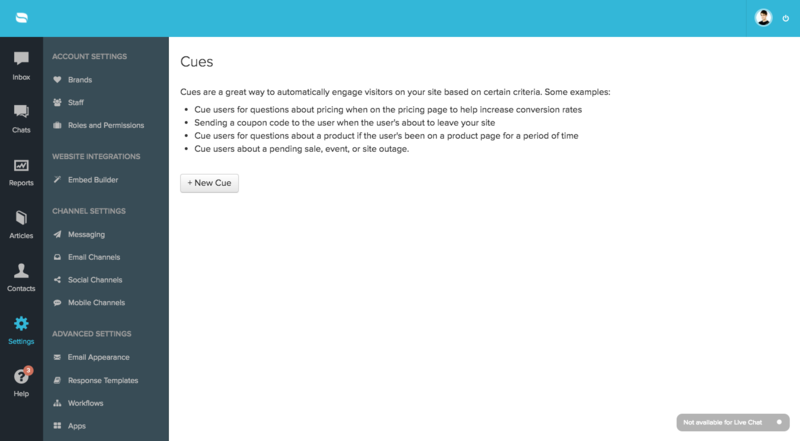 Once complete, save your work and refresh your site to test your Cue. Remember, all Cues will be displayed according to the rules you've assigned to it. If your Cue is not to show until the 9th visit, you won't be able to trigger it successfully until the 9th visit. 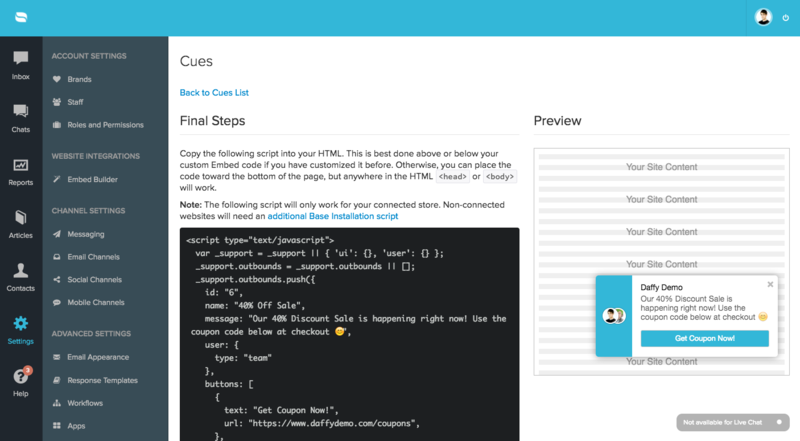 Note: Each Cue (built with the Cue Builder) you create is displayed only once per customer (until they clear their cookies). Advanced users of Reamaze Cue should leverage the Notifications API to control time-based configurations. Advanced users should also visit the Cues API for further reference. All Cues are listed based on their created time and in chronological order. You may scroll through your list of Cues and get a glimpse of the message and configuration itself. 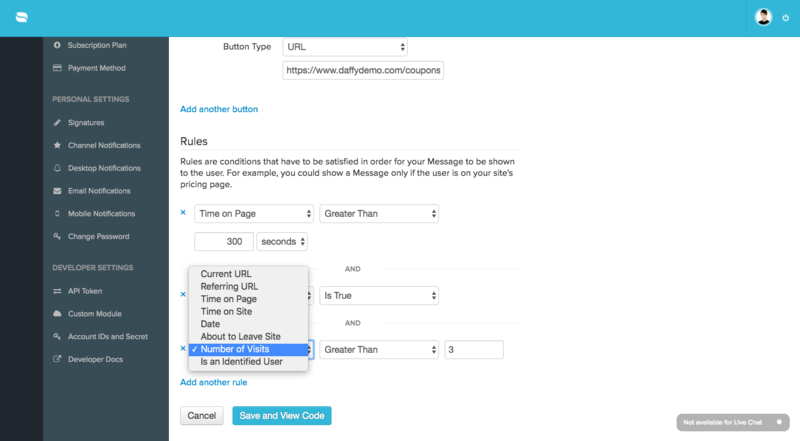 If you'd like to expand the power of Cues, you may use Shopify Liquid rules in Cues for more advanced functionality. See this article here.